In our family there is a soup my mother makes that is simple but a huge favorite of everyone in the family. Every birthday she would ask each child what we wanted for our special birthday dinner, and then cringe when we requested her special, Potato Soup. “You don’t want Pizza?” she would ask. No, we all wanted her special soup, which is warm, hearty, and full of yummy flavor. My mother is modest and labels it the poor man’s meal because it is stomach heavy and will leave you full for days but in our minds that’s one hell of a soup. When it’s time for a family reunion you can be sure this delicious meal is not a request but an immediate demand from all of us, and even the grandkids too, now. I remember when I went off to college, my sister and I tried numerous times to replicate it without success. Our sauce was either too runny or like glue. It just didn’t have our mother’s touch. So finally the last time my mother came to the UK to visit me, I insisted that she stood over me and coach me through her recipe, so I can see where I was going wrong. Now I love making it for my own family. 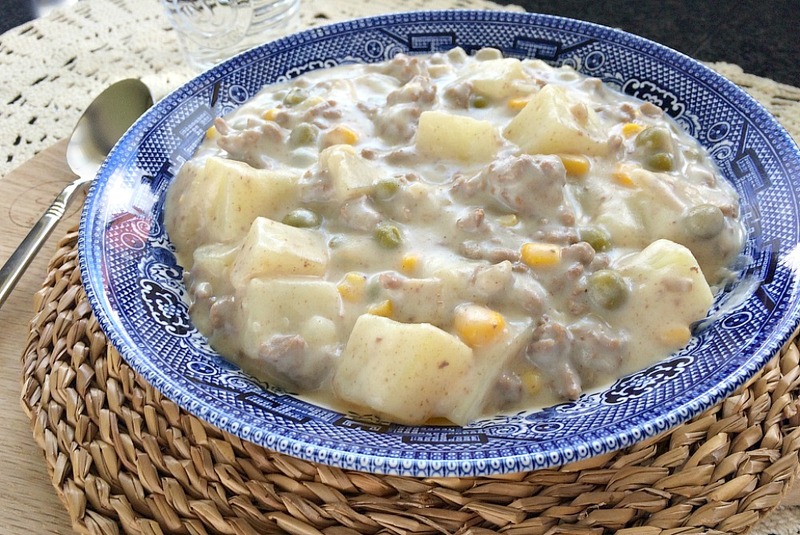 My brother was pleased this week when he arrived in the UK and I was serving my version of our Momma’s potato soup. I love to learn family traditions and recipes that I can pass down one day. I do have to admit I have now added my own ingredients to suit my family members’ tastes. So here is my Momma’s famous “Potato Soup” recipe and a few marked ingredients with a *, I have added to make it my own style soup. Why not add a 1/2 cup of crispy, cooked bacon or grate cheese on top with cajun spice for a spicy flare? 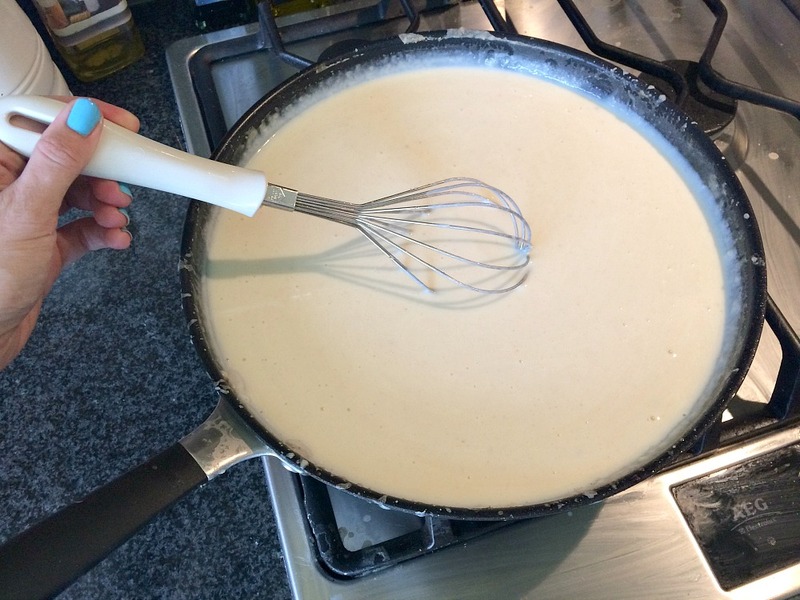 Make sure you use a large enough skillet for your white roux sauce. I used to have to make this sauce in two skillets as I didn’t have a large enough one to make enough sauce for the entire recipe. I am loving my new Oxo Good Grips 28cm frypan for this recipe. It’s triple layer non-stick coating makes the perfect White Roux Sauce so you don’t have to worry about not stirring enough and burning your sauces. The soft, non-slip handle is great for pouring my roux over my ingredients in a larger pot. My old frypan used to burn me and there have been times I have dropped it while transferring my sauce to the pot, not anymore. It’s even oven safe if you want to keep that beef, onions, and peas and corn warm while you boil your potatoes. This recipe can be served with grated cheese (our family loves pepperjack cheese in it) or saltine crackers (Doriano crackers in the UK) crushed on top or just with some good old salt and pepper. If you have leftovers, it can easily go in the freezer for a future rainy day. Don’t like chunky soup, you can always blend this all together. BABY TIP: I used to blend this up, add cheddar cheese, for my son and daughter when they were weaning onto solids. They loved it. Great for the whole family. If you try my soup would love you to tell me what you thought of it. Tweet or Instagram me a photo and I will re-share it! If you don’t have the time now why not pin it to your pinterest board for later or pop by my boards for a peak at more fabulous recipes. 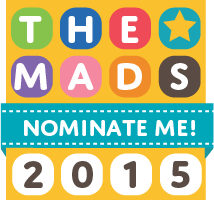 Would love you to consider voting for LTM for the MAD Blog Awards, click below! Thanks. It’s so eats and such an easy one to make on a cold day. This made my mouth water, it looks so tummy warming and delicious. I think I would need a nap after it. I usually make chicken with potato. I need to try it with beef! It was so delicious and perfect as it’s been so cold and I wanted something so comforting. Thanks hun. Thanks Mila. It really is the very best comfort food indeed. Oh thank you so much. That’s awesome. Hope you enjoy it. That soup looks amazing – so comforting and filling. 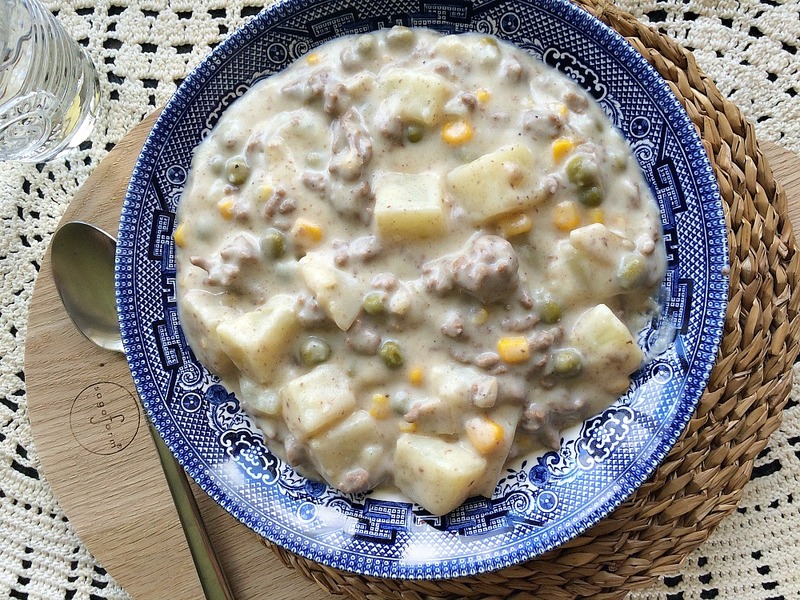 We have a couple of similar family recipes involving minced beef and cubed potato but with a tomato-based sauce. I never thought of using a white sauce to make a soup but your Mom’s recipe looks so delicious I will have to give it a try! Oh that sounds delicious too. Will have to try it with tomato sauce yum. Thanks Hun. Ooooooh *wipes drool from chin*. Looks lush. We give this one a whirl soon! It truly is and hoping it gets passed down to generations too. I was so excited that I perfected it and altered it to make it my own family tradition and that I could share that with my brother too. Was great. I find a lot of people that don’t like soup still like this as it’s super chunky. You could drain white sauce over and it would just be like a casserole. Oh yes countdown has begun!!! Can’t wait. It’s a little bowl of home here. Okay so I am officially hungry now. No breakfast yet and I am wondering if we have the ingredients for potato soup downstairs!! This sounds lovely and satisfying too. It really it a lovely soup so homey. Oh that sounds divine. Love a good soup too. Thanks darling. It really has great memories with it too. I can almost smell that lovely soup. Soups have always been a bit hit and miss with me, guess I have to be in the mood. But potato soup is always a hit. I am the very same. 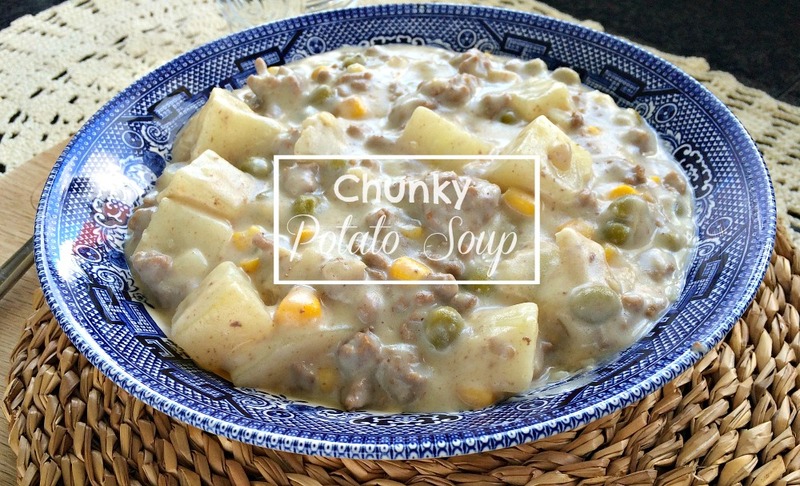 I need to be in the mood for liquid soups but love a chunky stew like soup anytime. So comforting. This is a lovely post, Jenny. I love that food is so evocative. Me too hunny. This one has so many memories tied to it. Do and let me know what you think nits so easy and fast to make. Me too. One of my favourites and so comforting. What good kids, asking for soup instead of pizza! Looks delicious though! Definitely try it out. It’s super easy and so yummy. This looks mouth-wateringly good, and absolutely perfect for cold days and nights. I love the fact that the ingredients are not complicated–you can find most of them in your pantry! Lovely recipe, Jenny. Definitely trying it next week. Thank you for sharing! Exactly. All my recipes are easy, fast and ones you would mostly have stuff in your kitchen for. Try it out let me know what you think. Kids love it with cheese grated on top. I am too believe it or not. I just make basic easy recipes for my family. But I think those are the best sometimes. Oh it’s so versatile too. You can throw anything in it. Blend for a liquid soup or keep chunky. I love a good soup stew. This looks amazing – I do love soup. I have fond memories of cooking up huge batches of potato soup at uni with my friends to save money…yours looks much much nicer than those concoctions though!! I love the idea of passing on recipes – from my mum I learnt how to make bread and memorise cake ingredients and from my dad I learnt a noodle soup mess (from his years at sea as a captain in the navy, it’s literally all he can cook!). They all have memories. I love a recipe that also brings memories back and means something special. Oh thanks so much for adding it to your favourites. Let me know what you think. I think moms always do it best but hopefully MM thinks that about mine someday too. Oh yes I love a good hearty meal. Soups are the best. 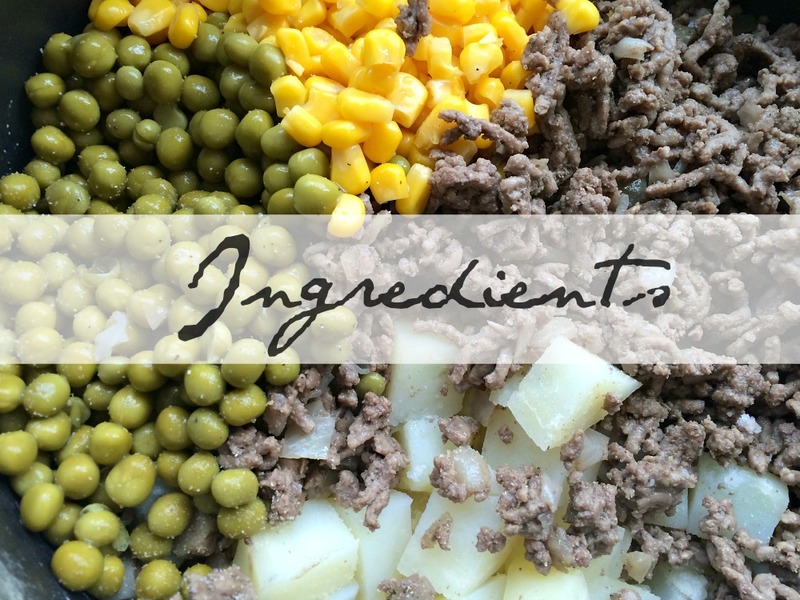 Oh yes I used to make this all the time and blend when I was weaning and getting the kids to eat vegetables. Try it out. Oh that sounds good too. Love a good hearty meal. Looks lovely. Thanks for hosting #sharewithme. Sorry I’m so late to the party this week! Never too late darling. Thanks for joining in. Oh those sound like family classics too. Yummy. Thanks Hun. Oh thanks so much for pinning it darling. Oh yes that would taste good too. Love a good substitute. OMG I am SO going to try this! Not a chance of either of my girls eating it but it’ll keep me going. I’m such a rubbish cook, I need easy recipes!! Thanks Steph. Yes do it’s so easy and great for everyone. I swear it feeds you for the day. lol Love a good hearty meal. Thank you darling. It really is and so easy to make. Love recipes that hold emotions and memories too. Interesting recipe putting the mince in it, but sounds good. Would definitely be a good filler. That looks perfect for a cold rainy day. Will be trying this one. MMMM you’ve made me hungry reading this! Me too, they are my fave and I love making them homemade and throwing various things into them each time.